I hate those photos… I rarely find all of the differences. At any rate, I just want to know if you can see a difference between the boucle and the regular yarn in the Omega Wrap. 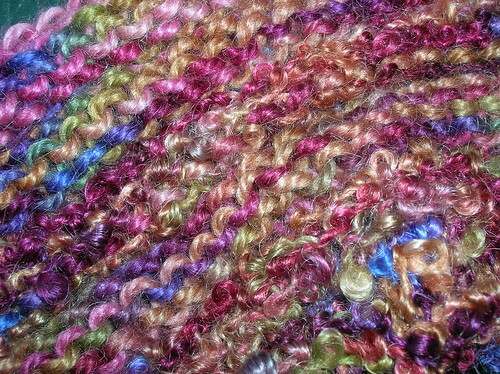 The Knight and I decided last night that I need several rows of the boucle for it to show up as different. Can you even tell?! I only care because I don’t enjoy knitting with the boucle, and if it’s wasted effort… Sigh. In happier news, two packages were on the porch. One was from Amazon, Wrap Style. 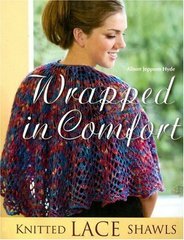 I did order the book, and I want it, but I’m eagerly awaiting my Knitpicks order and ANOTHER book. The good news is that while I wait another day or two for that book, I can finish up my Omega Wrap and be ready to start the Bigfoot Shawl right away! 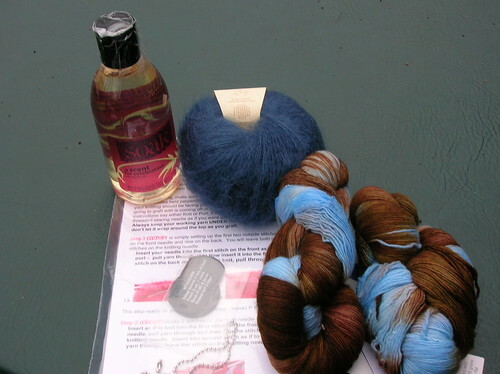 My package from The Loopy Ewe also arrived today. I scored some of the Malabrigo laceweight, and I got some of the kid mohair to try another Dog Paw scarf with the suggested material. There’s also more Soak and some kitchner dog tags, for the day when my fickle needles return to socks. In other happy news, a couple of my parcels from Wednesday’s big ship-out have found their marks. Amy got her Pay it Forward gift, and seems pleased. I knew she’d love the colorway, but I’m delighted that the whole shawl suits her! Nichole also got her wrap, and was even more delighted than I anticipated. So, my Pay it Forward knitting is done, but I’ve enjoyed it enough that I intend to continue to surprise my friends when I find a pattern and/or a yarn that calls out to them, as was the case with the modified Dog Paw scarf I sent to Michelle. We now return to the knitting already in progress. Let the weekend begin! I do believe my weekend holds some fun and hopefully, an FO, so come back soon! My brother inlaw and I snapped photos almost endlessly, but missed almost every shot. 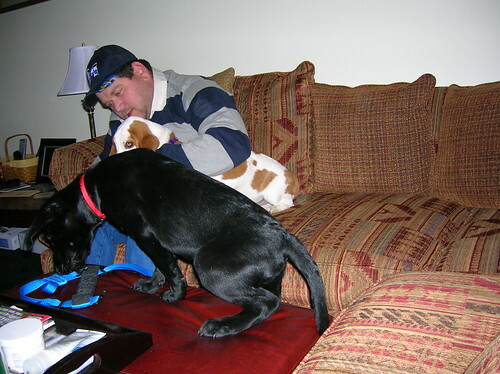 Most of the playdate went like what you see above; the two young gal pups ripped, ran, jumped and tumbled, while the humans took turns loving on Mugsy, who wasn’t interested in such antics. Sissy’s vertical leap impressed us. 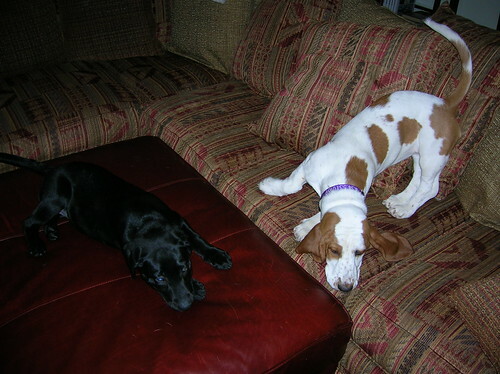 I mean, we knew she could jump but… She and Sam both used the furniture strategically. I could share all 20+ photos, but instead, I’ll leave you with a photo that makes me want to have a photo caption contest. (Note: I’m not having a contest, but feel free to entertain me…) What are the Knight and Sissy discussing? And does Sam *REALLY* have that much interest in Sissy’s harness? In due time, this will hold shots of Sissy and Sam having their first playdate, with Mugsy looking on with mild disinterest. We’re carting the Prince and Princess over to Sam’s house (formerly known as my sister’s house) around 7:30 eastern time, so I should be able to show some puppy love before bedtime tonight. In other news, do go visit Devon and whisper sweet somethings in her comments. It’s a neat contest, and I know I definitely need to celebrate her bloggiversary, because without her, I’d never have knitted my first sock! 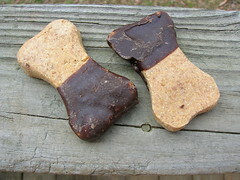 Also, stop in and read Firefly’s Dogs on Thursday post. It’s true. Her boys do have magical powers and ooze sweet doggy love from every pore, but I’ve also seen the same magic play out in my own life. Grumpy, mean customers laugh and scold ME when Sissy jumps on them and I try to correct her. More to the point, I can be in a foul mood, and just a sweet, caring glance from Mugsy or Sissy reminds me of how much I am loved, and that the world isn’t such a bad place after all. Happy Little Friday, and bring on the weekend! Mugsy and I are having tea. (Sissy’s napping. Gotta’ love those puppy evening naps.) It’s probably not technically afternoon here anymore, but who cares?! 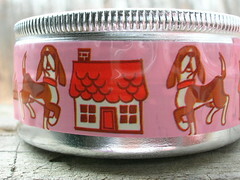 Are these not the cutest tea tins EVER?! 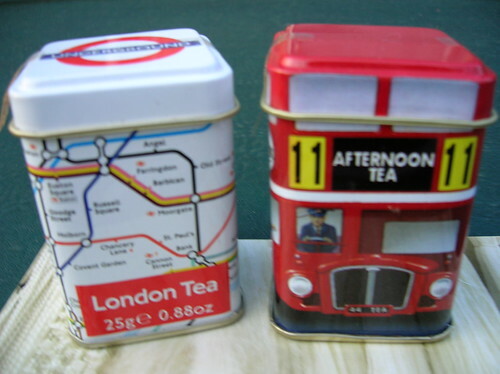 Straight from London, courtesy of my WordPress coach Monica, come the bus and its traveler’s pal, the map. Joy! They didn’t travel across the pond alone. They brought along these beauties. 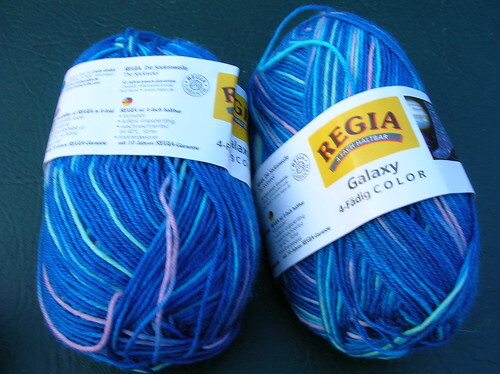 I cannot WAIT to turn this made for me colorway into socks. (The ones for my mother’s birthday just got bumped down the queue…) Many, MANY thanks Monica. They did indeed arrive on a bleak and blustery winter’s day and I am most assuredly cheered by your thoughtful generosity! I was rewarded for sending out several packages myself by having a two parcel day at home. 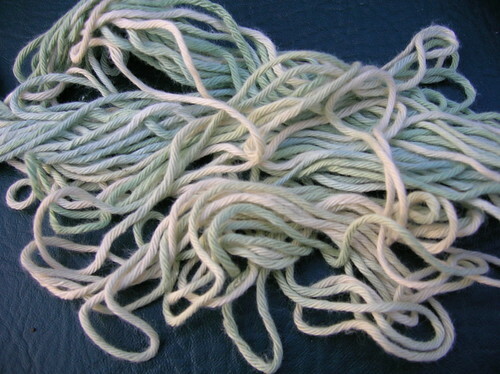 This wad of cotton is Knit One Crochet Too’s Ty-Dy, in the very colorway that is in the lead for my Clapotis yarn. A vendor in my Yahoo Group knits was kind enough to send it to me to try before I buy. You know I love that kind of customer service, so if it knits like it feels to the touch, I’ll have to make a color choice very soon! 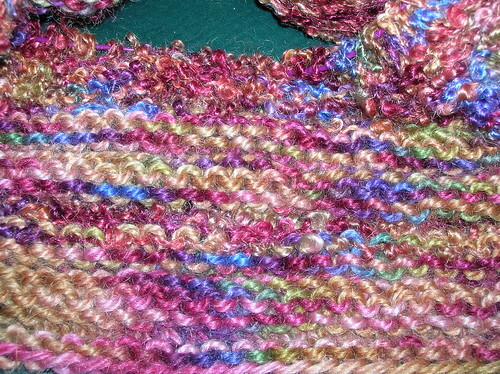 Details: 7 skeins of Plymouth’s Oh My!, 6 for blankie, one (almost to the centimeter) for the shell trim. I had feared I’d need more for the trim, so I have one ball left over. That’s ten sets of 35 stitches there, thank you. The shells were crocheted, and I’m soooo pleased with this whole project, done on #8 Knitpick Metal Options. I did cast on with the Bryspun DPNs, and I can promise you that the next trip to Knitting Addiction will find more of those and the Oh My in other colors in my basket. I think I used a J hook, but maybe not. I can’t wait to present this to my friend; I very nearly took it to her last night, but then I’d have to whip up another shower gift! The Knight is demanding a baby hat with the remainder. What say you? Look ma, I got gauge! Me, the loose knitter (or so I thought? ), I’m getting 3 stitches per inch on the #10.5 Harmony Options. Whoda’ thunkit? So, the Omega Wrap is underway, and I moved up to the Large size too. I’d rather have to fidget to keep it on my shoulders than have parts smashed or yarn stretched a bit below the shoulders, ya’ know?! Oh – and Firefly? – it’s a mohair blend. I won’t make it back to the beach before your birthday, but maybe I’ll find a few skeins for you there… I saw more of the same yarn there last visit. Now, if you’ll excuse me, I need to go play with the Ty-Dy and make a decision, and I really want to make serious progress on the Omega tonight too. Last night was long and tedious, so I think I’ll make another pot of tea and settle in. Ironically, the new slipcover for our sofa is green. It’s on order, and should be here any day. How fitting, because Sissy is learning to hop, and I swear I heard Mugsy say “Ribbit” yesterday. No photos. I didn’t get home until around dusk last night, and it is raining this morning. The baby blankie is done, and I can’t wait to show it to you. The scarf is done too, but I don’t think you need another photo of that. Devon asked me this morning what was on my needles. Nothing. Sincerely. I have the start of a snuggle for Sissy on the hook, and I have yarns out for three different projects, but all I can do is cast on, knit one or two repeats, and frog. Seriously. My Fred Yarn needs a special wrap pattern. It has to be big, comfy, and not at all delicate. I thought I’d found that in Cozy, until after well into the second repeat of the lace, I realized it just wasn’t looking anything at all like the photos. Duh? 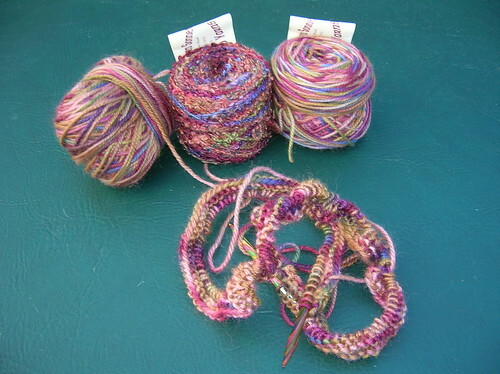 DK and Bulky yarns are rather far apart. I have lots of yarn, but not the THOUSANDS of yards it would take to make the pattern work with Fred’s Yarn. So, I spent several hours organizing my loose patterns and searching Ravelry, and I’m pretty sure I ordered Wrapped in Comfort yesterday. 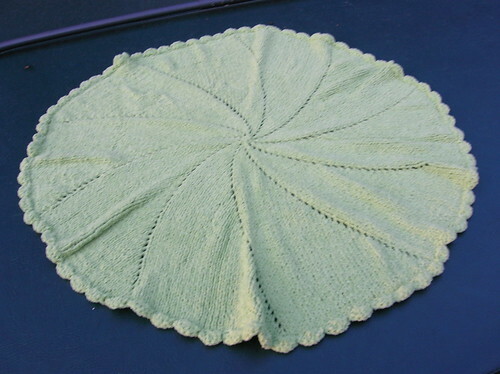 It contains a pattern I believe will be perfect – the Bigfoot Shawl. It’s perfect because it will wrap around me and comfort me, which is what I want, even though Fred was more of a sit on your feet kinda’ guy. It’s perfect because the Knight was known to call his dear boy a big footed sucker (or something like that) as Fred rolled across a bare, human foot. So, not caring to start a sock at ten o’clock at night, I pulled out my three lush cakes of Ellen Cooper yarn, and cast on for the Omega Wrap, after much measuring and debating over what size I might need. I decided to do a medium, and picked up my #8 bamboo circs (which I’d just purchased to use with the Fred yarn, of course). I have Harmony tips in #10.5, and the pattern calls for #10. Knowing I tend to knit loosely once I cast on, I thought the #8s would be about right. Pattern calls for 3 stitches per inch. I had a very generous 4. I shoved the whole mess on the table and went to bed. When I got up early this morning, literally with no lights on, I frogged. I knew it had to be done, and I knew it would be easier if I didn’t dwell on it. I’ve come to accept frogging as a part of the process, thanks to lace. It no longer pains me to discard even hours of work. Granted, with lace, that’s more likely and more of a necessity. I’m pretty good at fixing mistakes, even a few rows back, but sometimes with lace, it’s just best to rip. One of these days, I’m going to rip the start of the wrap for a someone special. I get bored easily, and I’ve since learned that what pattern writers call a four-row repeat is really two patterned rows with rows of pure knitting or purling in between. Plus, I don’t intend for that to be a dainty wrap. Light, but not fragile, and I’m afraid all of that open stuff won’t be practical enough for the intended recipient. Anyhoo, back to the Omega. (And my little mind hears “The Alpha and the Omega, the Beginning and the End.” Indeed begin again.) PLEASE help me. What do I try? Yes, yes, me gonna’ swatch, and not in the 140 actual cast-on stitches as I did last night. Do I use my (sigh, used to love them) metal Knitpicks and try a #10? Being a whole stitch per inch off, dare I try the #10.5 Harmony tips? A whole inch off. It boggles the mind, because I generally do knit rather loosely. I really am motivated to get my work done early on Mondays so I can catch up on all the blogs I didn’t read over the weekend. That means this is a great time to catch you up on some things you might have missed. BananerKnits is hosting a very special contest. I already have a yarn in mind, so I just need to pick a pattern and cast on. Please consider signing up! Anne has announced that sign-ups for the next coffee swap will begin on March 20th. 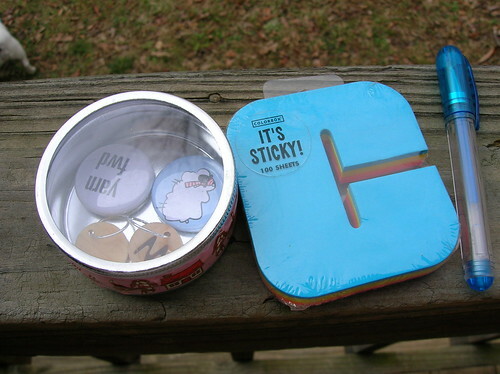 There’s a contest involving buttons, but I’m not creative, so I wish the rest of you luck! Another photo-heavy post, but y’all know I love to share a great package! There’s nothing like having an Etsy-seller friend send you a message and tell you she’s holding something she thinks you’ll want. 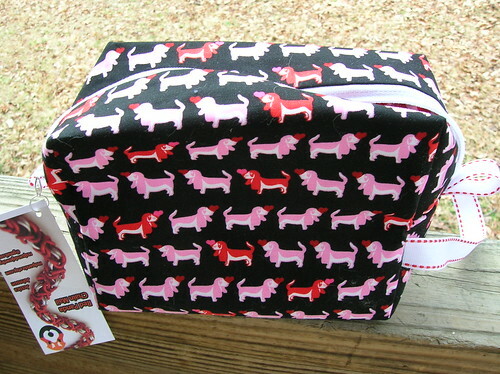 That’s just what my Ravelry Group Basset Cases co-moderator Piddleloop did about ten days ago. I’d been eyeing her bags (well, she and her sister are a team) for a while, and this batch of bags was the last of this fabric. 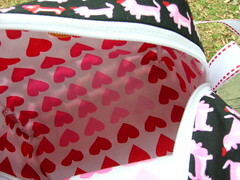 It’s the Sissy-Fred bag, and I’ll be hard-pressed to use anything else for small projects. All the other goodies that came with it, and a gratuitous shot of the Prince’s rear… ehm… Mugsy sure seems to be shoving his way into photos of late. The goodies came in Hello Kitty bags. They’re too cute not to recycle. 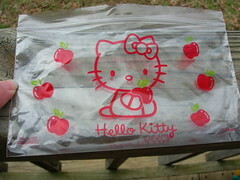 I know someone out there loves Hello Kitty, but I can’t recall whom… Is it you, Anners? Thanks Paula! Now, I’m not going to tag anyone in particular, but if you’d like to join in, consider yourself tagged!